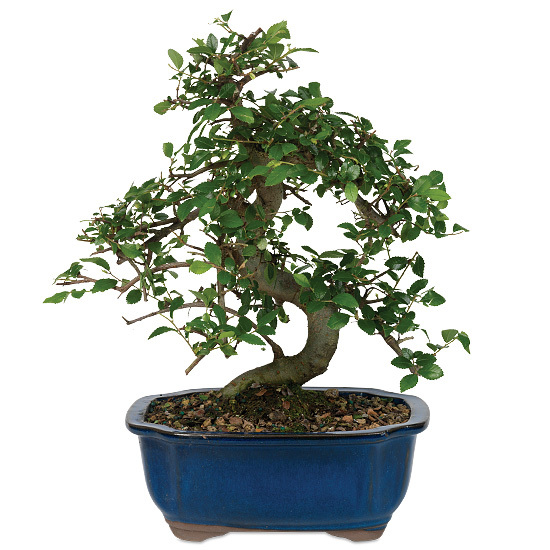 Full of life and fun to have around (not to mention remarkably easy to care for) bonsai trees add such a unique beauty to home and garden. These five-year-old trees are sent directly from China, where their small leaves and tiny twig branches have been painstakingly trained for years to become the perfect little specimens they are. Planted in a traditional bonsai pot, they’re hearty in nature and prefer outdoor settings, but will do just fine displayed indoors for weeks at a time. Did you know we offer a 3 Months of Bonsai gift program? Your bonsai is hearty in nature and prefers an outdoor setting, but will do just fine displayed indoors for weeks at a time. Place in full sun or partial shade and water daily during the growing season. Fertilize using a slow release organic feed. Most shaping can be done by pruning. Be gentle, its bark is thin and may be damaged easily.